Bedale is recorded in the Domesday Book (1086), at which time it had a Church. By the 13th Century, a park for hunting had been established, and in 1251 the Market Charter was granted. It was probably following that grant that the wide Market Place south of the Church was laid out. The earlier focus of settlement would probably have been around the Church and the castle, built in the 13th Century a little to the south west of the Church. Few traces of the castle have been recorded. NA-102Although Bedale dates back to the medieval period and beyond, its high point must have been in the late 18th Century, a time of prosperity when the town centre was improved. At this time, the Market Place Tollbooth and other buildings were demolished, and the western side of North End largely re-built with superior three storey houses which gave this street its Georgian dignity. The local shoemaker and diarist Robert Hird (1768 – 1841) recorded how the town changed from a huddle of timber framed houses with thatched or slate roofs to the late 18th Century Georgian elegance we see today. Were Hird to return, much of the main street would be familiar to him. The town probably grew up around the Church, Castle and Hall with the Market Place added to the south. The 14th Century Market Cross stands at the meeting place of the Wynd, Emgate and Market Place, the main medieval roads. The wide Market Place, lined with buildings at the head of long narrow garden plots, was probably laid out following the foundation of the market. This pattern of long narrow plots reaching down to Bedale Beck to the east, and to the Back Lane at Wycar, is one of the important characteristics of the town. In the 18th Century, while the better quality houses were grouped near the Church and Hall, by contrast, Emgate was home to Bedale’s industries which included cloth fulling and tanning, which were particularly unpleasant. Emgate contained many cottages, described by Hird as “low and numerous”, many built of timber and daub with thatched or slate roofs. Bridge Street is relatively modern. It does not appear on a map of the town made in 1786, but is shown on a map of 1838. It clearly cuts across the grain of the garden plots, and contains the 19th Century Auction Mart and Old Chapel. In 1850, just before the railway arrived, the town straggled southwards along South End, towards the Widows Hospital (almshouses now demolished) and the Workhouse, later to become Mowbray Grange Hospital. Later 19th Century terraces of houses are a feature of this area. Beyond the garden plots west of the Market Place lies Wycar with a triangular green planted with mature trees. Bounding Wycar and along the southern boundary of Bedale Park are several Victorian or Edwardian The Heritage Trail leaflet can be obtained from the Tourist Information Centre in Bedale Hall or download it here. 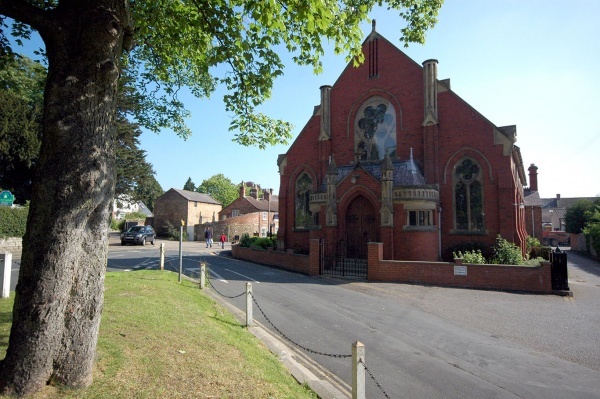 At Wycar is the Methodist Chapel which has been there since about 1750.